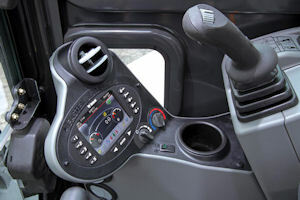 A new forward-mount instrumentation system designed for enhanced functionality and improved ergonomics is available for six existing models of Bobcat compact excavators. The new instrumentation system, introduced with the E32, E35, E42, E45, E50, and E55, presents operators of Bobcat excavators with many of the functions, aesthetics and visibility they’ve come to enjoy with Bobcat loaders. It can also help owners and fleet managers better understand and evaluate their performance and costs, as well as assist them with identifying opportunities to improve machine and operator efficiencies and protect their investments. With the new system, dealers can also upgrade keyed machines to a keyless start system much more cost-effectively.